To enter, visit my Craftsy shop. Come back to this post leave me a comment on this post telling me what pattern is your favorite. (Cupcake Countdown and Square Dance are only there temporarily until I get the paper patterns, but they still count.) Please consider becoming a follower if you aren't already. The deadline to enter is this Monday the 25th at midnight. And if you get a chance, hop on over the Madame Samm's too. 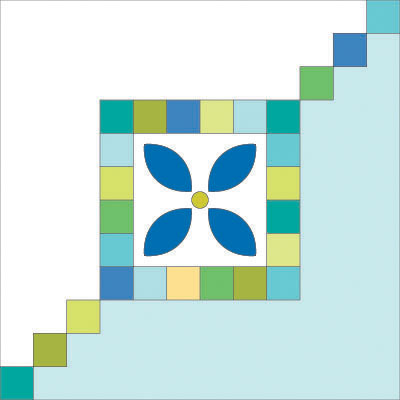 I'm guest blogging there tomorrow with directions another quilt block - "Park Place!" and some fun quilt layouts too. Your cupcakes are really cute, but I like Garden Paths the best. Town Square is my fave - it always catches my eye :-) Thanks for the chance to win the fun fabric! I love dessert! I still love Bubbles! This one is super cute though! Thanks for the giveaway! They are all nice, but I especially like Square Dance. Thanks! I like Garden Paths! Looks so effective. And Cupcakes is so cute!! Cupcake countdown is my favorite, but Garden Paths is my second! I love all your patterns, but my favorite is still Garden Path. Cute new Pattern! I really like the Garden Paths pattern. Thanks for the chance! Square Dance is my favorite. Being a confident beginner it looks easier. Thanks for a chance to win. Blossoms is my absolutely favorite, but I'd love to have the cupcake fabrics & pattern to make a quilt for my granddaughter who just adores anything cupcakes!!! Virginia Reel is so cute, would be great with the Cupcake fabric wouldn't it??!! Square Dance is nice but its tough to choose just one. YOU are too sweet...lol and Blossoms is my favourite, today, but that changes everyday I see a new design, tomorrow it could be topiary...wink..
Wow, i love them all but i think Garden Paths is my favorite...altho those cupcakes are pretty darn cute! My favorite is Garden Paths. Thanks so much! Those cupcakes are so cute. But my favourite quilt is still blossoms. Just love this one so much! I like the Garden Paths! It's so unique! Thanks for the chance to win one of you pretty patterns!!!! Not even sure where to start since I think they are all awesome! Topiary Tiles and Garden Path are tied for 1st place with me right now. My fave is Cupcake Countdown, although Blossoms are pretty close too...something about cupcakes though :) Oh, and I'm already a follower. I'm going with Cupcakes and I am a follower too! I love the Cupcake Countdown...so adorable! Blossoms is my favorite pattern in your Craftsy shop, though Cupcake Countdown is pretty cute too! I really like Garden Paths but they are all wonderful. Oh my--Cupcake Countdown would be perfect for my dear friend who has a "treats" business! You are amazing. So, that is likely my favorite, although Blossom is pretty dear to me, too. Wow, that was difficult. All of them are great. But your cupcake countdown is my favorite. LOVE Topiary Tiles. Just downloaded it - thanks! Blossoms is my favourite. I already follow you via email. I think maybe town square is my favorite. I follow you. I love Under the Veranda. Village green is my favourite. Garden Paths is my favorite. Thanks for the chance to win. Those cupcakes look yummy. So does Blossom. My favorite is Portraits of My Garden. Thanks for the giveaway. My favorite today is Under the Veranda. They're all so nice though, that tomorrow I may have a new favorite! I've only just found your blog, so feel a bit cheeky entering, however I'm extremely taken with the 'Garden Path' design, I've never seen anything like it, it's really beautiful. PS Needless to say, I'm off to join up as a follower. Blossoms, where cupcakes are being eaten. This is one of the many designs I love, got the hint from Madame Samm's but I like leaving fave blogs to last. I like all the patterns, but I like Bubbles the best! I have four little grandchildren and will need to make the cupcakes, but I love all of your patterns with Square Dance being at the top. Your use of applique is so fun though, that it makes the choice so hard. They are all wonderful. I love Under the Veranda. Thanks for the chance to win. Amanda, it would have to be Town Square since I purchased it last week. Thanks for the opportunity to win this bundle of lovely fabric. Its a toss up between Blossom and Delicious Green. I love vibrant colors, and those patterns just spark my creativity with the possibilities and make me smile! You have some darling patterns,it's hard to pick my favorite! But I think it has to be Beflowered, that is just so darling! I truly love all your patterns, but if I have to pick one....Portrait of My Garden. I would be thrilled to win that fabric, so I could make Cupcake Countdown for my grandchildren. Thanks for the great giveaway and for all the beautiful work you do. I would have to say Garden Paths or Blossoms are my favorite. I really like Cupcake Countdown, too. Oh my...Amanda I like all of them!! ok..picking one; Blossoms and maybe Garden Path...lol I am a follower my email. thanks of this. I love all your stuff but Cupcake Countdown ALWAYS brings a smile to my face everytime I see it...Wonderful memories of baking with my grandmother!!! I love your Blossoms pattern. I have been keeping my eye on it. My favorite, though it was very difficult to pick, is Garden Paths. It's very different from most quilt patterns, and I love different! "Garden Path". Thanks from all of us for the giveaway. Town Square is my favorite, but Amanda I really Love all your designs!! I just don't know how you do such small squares like in "Park Place" and they turn out so beautiful!! Yes, I would Love to win some Fabric too!! The bubbles pattern is my favorite! I think my fav at Craftsy is Cupcake! After you showed that pattern, I was rooting around in my stash and couldn't find anything to make that adorable quilt with - sure hope I can win! Thanks for the new Park Place block, too! I love Village Green, but your new Cupcake pattern is wonderful and I think that is now my new favourite of your patterns. Garden Paths is my favorite. My fave is the Village Green Pattern with the appliqued flowers in the centers! Thanks for the wonderful giveaway! I'd love to make the cupcake quilt! I've been a follower of your blog for awhile! I LOVE under the veranda! How lovely!! I would have to say that the Cupcake pattern is calling me. Probably because I always tell my students "If you want cupcakes and rainbows, you have to work for them!" I love the cupcake, but Village Green would be my favorite. Thanks for the chance. I love the cupcake countdown but also love the look of your town square. Bubbles is my favorite, but I love your Cupcake Countdown too. And that fabric is wonderful. Cupcake countdown is my first favorite with Blossoms a close second. Thanks for the chance to win. 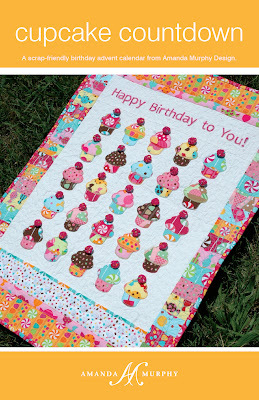 I love the Cupcake countdown but when I look at your patterns I fell in love with the Bubbles quilt. Thanks for a chance to win. I love the colors. I love Garden Paths although if I make cupcake countdown my 3 year old son would flip - he loves cupcakes!! Thanks for the chance. Thank you for the generous offer! I like Blossoms and Topiary. I like your Garden Paths but they are all great - thanks for the giveaway. I like the Blossums pattern. A great way to make a scrap quilt with pretty flowers as focal points. Thanks for the chance to win! By the way, I love the pattern you posted as guest on Madam Samm's blog! Going to try that one! Blossoms is my favorite as well. With two tom boy daughters, would love to make Blossoms for myself. Garden Paths is my favorite! Thanks for your post over at Sew We Quilt...so cute! love cupcakes and garden path. too cute! Blossoms is my favorite. Very cute! Thanks for the chance to win! I love the cupcake countdown. I have always loved Bubbles!! Love your cupcakes but I like Garden Path best. I like Blossoms the best, but these cupcakes are adorable for sure! I love all of your patterns ut my favorite is probably the Blossoms. The flowers just make it pop. Your latest pattern is delicious looking! My favourite is Garden Paths. They are all so cute, but I'll choose Blossoms -it's just so cheery! Thanks for the giveaway! That is such fun fabric and it looks wonderful with the cupcakes. I really like the blossoms, I think that would be wonderful with these fabrics as the background and then the light flowers in front. It is hard to choose, they are all great patterns. But if I must choose - Town square is my favorite. You are really an amazing and talented designer. I don't know how you do it all. You are always creating new blocks for Madame Samm. I have made a quilt from your diagonal design in solid yellow, white and black and yellow prints. My husband wanted me to enter this quilt in our Sonora fair next month. I have a binder that now holds all of your patterns and block designs now. Thank you, Amanda. I am going to choose Portraits of My Garden. I can see myself making this quilt, again for me. Love your patterns, town square would be so much fun to make , thanks. Your patterns make it hard to choose, but I think I'm in love with Blossoms... It's on my "to do" list one day! Just is so bright and cheerful! My favorite pattern, right this minute, is Square Dance -- but they're all adorable! Blossoms is my fave! Thanks for the give away opportunity. Love them all but Village Green is my favorite!! They are all wonderful! But probably Garden Paths would be my favorite & thank you for the giveaway! Love them all!! Dessert Party fabric is perfect for Cupcake Countdown! But my favorites remain Garden Paths, Blossoms, Square Dance, Bubbles, and Village Green. Thank you for the giveaway. All of them are lovely, but Garden Paths would have to be my favorite! Thanks for the great give away!! Love your patterns and Garden Paths is my favorite. Your new patter, is just delicious!! All of your designs are delightful. I have pick Cupcake Countdown as my favorite. Thank you so much much for the chance! I like the cupcake countdown!!! My almost two year old granddaughter loves cupcakes...morning, noon, or night...anytime is cupcake time. Cupcake Countdown is adorable, my little niece would LOVE it ... but Garden Paths is still MY Fav. Thanks for the chance to win!! All so pretty but my favorite is Topiary Tiles. I like Gardoen Paths too, but I LOVE Cupcake Countdown! I'd pick Cupcake Countdown because I'm a HUGE cupcake fan. But, seeing that some of the focus of this post is on this pattern, I'll choose another favorite. I'm loving Portraits of My Garden at the moment. Thank you for a chance to win. PS is the deadline tonight(Friday)? or June 25th (which is a Monday)? I was confused when it states "to enter is this Friday the 25th at midnight". Blossoms is still on my "must make" list....but Cupcake is SOOOO cute too! I just picked up Portraits of My Garden at the quilt shop in Gastonia, and now I think my OTHER fave is Garden Paths, or Cupcakes or...well, on and on...love them all! So many pretty patterns to choose from - but I think my favorite has to be : Under the Veranda! So very interesting! Such a nice variety of blocks!!!! I love your Park Place block and quilt. I copied it (yes, I have links back to Mdm Samm's post and also your blog to make sure you get credit for it if I ever make it). This looks like it would be fun to make on my vintage machines. A block from each machine (I'm sure I have more than enough machines). Your cupcake quilt is cute, too! Thanks again! Yup..the Cupcake pattern is my fav. My granddaughter always makes cupcakes for family birthdays, so she would love this quilt. May have to buy it, thanks for the giveaway! I'm going with Village Green :) But, oh my, those little candy prints on that fabric above are just to die for! Portraits of my Garden is my favorite! HELLO! LOVE CUPCAKE COUNTDOWN-IT'S MY FAVORITE! HAPPILY FOLLOW YOU VIA GFC AND BLOG LOVIN'! THANK YOU FOR SHARING A SWEET GIVEAWAY! Garden Paths is one of my all time favorite patterns of yours. The cupcake fabrics and pattern is adorable. I really like your pattern "Under the Veranda"! It really caught my eye and I think I'm up for the challenge :-). Thanks for the opportunity. Love your new pattern, but my favorite is the Blossoms pattern. Love how you combined the piecing with the applique! Love all your work, but especially your square dance pattern. I like the uniqueness of Garden Paths and I like Under the Veranda because of the BOM style. I love Blossoms the best but really they are all lovely patterns . Thanks for the chance . Pinwheels are one of my most favorites! I have a little great-grandaughter and that would be adorable for her! Thank you for the chance and thank you for filling in for Madame Samm today. She always picks such great quilters and bloggers to fill in. Let's hear if for pinwheels! My favorite is Square Dance. Thanks for the chance! Garden Paths is my favourite. Thanks for the giveaway. I am traditional and I really like the Virginia Reel pattern. Colors can be cool and I like that. I like the town square pattern the best. 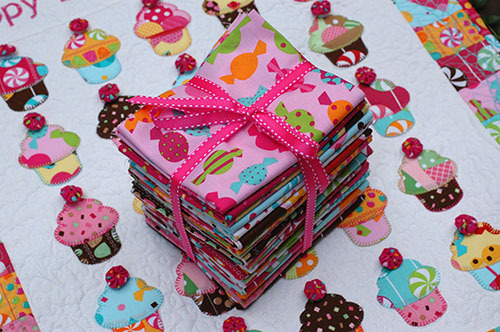 My grandaughter likes cupcake prints so this bundle would go toward making her something. Thank you for the chance to win. I am a follower. My favorite is Cupcake Countdown. Thanks for the giveaway! I love Garden Paths, but the cupcakes are so sweet! I really like Garden Paths. So pretty and symetrical. Thanks! I like Portraits of My Garden! Luv luv luv garden paths! This fabric looks delicious. Blossoms is still my favourite of your patterns. And that Park Place block looks great too. Town Square, Square Dance...and all the others. Such a hard decision. Love your cupcake pattern and fabric! Blossoms! But I like the cupcakes, too. All are very cute patterns! Garden paths is my favorite though! I can't decide between blossoms and cupcake countdown. They are both precious. Thanks for the giveaway. My favorite is town square. Thanks for the generous giveaway and have a have nice weekend! LOVE the Garden Paths pattern! my favorite is definitely garden paths! Cute patterns!! It's a close tie between Garden Paths and Cupcake Countdown as my favorite pattern. My granddaughter would love a cupcake quilt. Your patterns are very sweet. I like Garden Path. I'm a follower, too. With My Huge sweet tooth, I have to go with Cupcakes, however, I like Square Dance and Veranda...Oh dear I like them all!! Hope I win!! I really like Garden Paths, but Portraits of My Garden is lovely too! Garden Paths is still my favorite..however, love Cupcake Countdown. If you come from a large family it can be used several times a year! 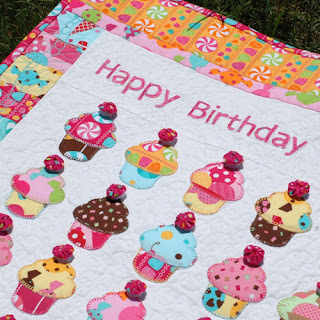 I love the Cupcake countdown, what a great way to use these cute fabrics! Portraits of my garden is my favorite because it lends itself to any kind of fabric. I have always loved your Blossoms pattern! However the Cupcake pattern is absolutely too cute for words! Garden Paths looks like the most complicated and intriging! The cupcakes look good enough to eat, but I really like the Spring Flowers, it just looks and feels like Spring, after a long winter. Love the color, bursting with new life/growth. Great job. So hard to choose! So many beautiful designs. I do love Under the Veranda. I would love to make that quilt with all the different designs. It's hard to pick just one, but I love BLOSSOMS. Just a flower nut, I guess. Thank for opportunity to be in the drawing. I can't make up my mind between Blossoms and Cupcakes. Blossoms seems so serene, but Cupcakes is such fun. Decisions, decisions!! I like the blossoms pattern. I do not over enjoy applique but my wife loves them and since I love her I love that pattern. Garden Paths is my favorite. Just love that quilt. I am a follower through Google reader. I so love the bubbles pattern! Love the Garden Paths - it would be fun to do at my next retreat. The Dessert Party fabric would be perfect for it! Love the Virginia Reel pillow! Cupcake countdown is adorable! And so is the fabric! Thanks for doing this giveaway.